Nie Yan glanced in the direction of the Lakeside. It seems they’ve already started. The Fishmen tribe was suffering an attack by the Victorious Return guild. This was why the encircling Fishmen had abandoned their attack and returned to aid their tribe. I never thought Victorious Return’s people would end up saving my life. Haha, this world is so wonderfully strange! After all the Fishmen had swum away, the surrounding vicinity was now completely safe. Hence, Nie Yan stepped up his search for nearby treasure chests. Eventually, he noticed another treasure chest hidden within the thick underwater vegetation. It was a white treasure chest, just like the last. The surrounding landscape… everything here coincides with the one in my memories. This is the location! Nie Yan opened the chest. Digging through it, he felt a skill book make contact with his hands. It was the Gatherer skill book! As he held it in his hands, it turned into a streak of white light. The skill bar for supportive abilities had another skill appear—Gatherer! Pretty decent harvest… However, I don’t know if there are any other treasure chests within this area. It would simply be a waste of time to keep searching. It doesn’t matter; I still know many other locations where I can find treasure chests. When I level up a bit, I can go pick them up at any time. Nie Yan swam, shuttling back and forth between the aquatic plants. If he encountered a monster, he would avoid them by staying a far distance away. After about ten minutes of swimming, he noticed a single island in the middle of Lake Rando. Only after noticing this did he swim towards the surface. Reaching the shore, Nie Yan checked his coordinates. As he was investigating the surrounding area, he discovered a person sitting in the far distance—fishing by the shore. This NPC was a very odd old man. He would make a request to every single player who encountered him to retrieve Fine Silk. For every bundle of Fine Silk that was brought back, the player would receive one Silk Cloth. If Fine Silk was sold to an NPC, it would amount to three coppers. However, Silk Cloth could only be sold for two coppers. If one continued on like this, there would be a loss in profit. Even after continuously exchanging with him, this old man would still do absolutely nothing to compensate the player. There were many players who would complete this task. However, every one of them would continue to receive losses—never to receive a reward of any sort. Nie Yan also did this task in his previous life. Only after delivering five Fine Silk did he finally give up accepting this quest. Exchanging Fine Silk for Silk Cloth was truly a waste of money. Sometime later, a person who did not believe he would continue to receive nothing, repeatedly accepted the quest. Only after delivering thirty Fine Silk did he finally receive a reward. This NPC would impart onto the player the Combat Medic skill—not only this, but it would be at the Intermediate level as well. After this information came out, it caused an uproar among the player-base. One after another, they would continuously rush over to accept the quest. However by that time, the NPC had already left. Currently in the area where Nie Yan was located, there were Level 3 monsters known as Water Spiders that dropped Fine Silk. Obtaining thirty Fine Silk would probably require about three days of continuous grinding. It just so happened that he could farm these thirty pieces of Fine Silk while also leveling up. Exchanging thirty Fine Silk for thirty Silk Cloth was merely a loss of thirty coppers, nothing more. Compared to an Intermediate Combat Medic skill, it was truly a negligible amount. Nie Yan walked over to the old man. The old man had grey hair and appeared somewhat senile with his age. Numerous wrinkles were spread across his face. As if withered, his skin looked similar to tree bark. Sagging like the folds of his skin, his ashen-grey cloak hung low by his fishing rod. From his impression, Nie Yan’s felt this NPC was a funny muddle-headed old man. He always asked a series of strange and odd questions, and it was fine as long as you somewhat answered them. However at present, when Nie Yan heard the old man’s words, “Yesterday is the same as tomorrow. Tomorrow is also the same as yesterday,” they had a new type of meaning. This old man wasn’t an old fool. Rather, he was actually quite wise! Hearing Nie Yan’s answer, the old man’s eyes flashed with a strange glint. Noticing the change in the old man’s expression as it fell upon his eyes, Nie Yan became increasingly convinced—this Old Man in front of him definitely wasn’t simple. “Time is akin to an illusion and moves like a pendulum. The months and years are wasted doing nothing and suffering eternally repeats. In the end, everything returns to dust. Even if those brave warriors are able to defend this vast great world, they won’t be able to escape the pain of illness and the Reaper of Death. In the end, what meaning is there to life?” the Old Man sighed. Nie Yan speculated that this old man was very likely one of the NPCs from the Hilton Stronghold, who left and journeyed outside in search of Fine Silk. Listening to Nie Yan’s words, the muddled expression in the old man’s eyes became clear. “Young man, I need a lot of Fine Silk. Is it possible for you to help me obtain it?” the old man asked. “It’s my desire to help in any way I can,” Nie Yan happily replied. These were the exact words he had waited for. Nie Yan began to recall. In his previous life, he had simply answered all these questions without much thought. The task he ended up receiving was “Nameless Old Man’s Request.” It seems the name of this current quest and the one he had received in the past weren’t exactly the same. This old man ought to be the NPC physician in the Hilton Stronghold… Did he come all the way from the Hilton Stronghold for the sake of finding Fine Silk? The fact that this old man also taught the Intermediate Combat Medic skill further confirmed Nie Yan’s suspicions. All of that doesn’t matter right now. First, I’ll finish this quest and think about it later. Nie Yan bid farewell to the old man and headed south of the small island. That region of the lake was an area where Water Spiders roamed about. Although Water Spiders were Level 3 monsters, their combat strength wasn’t that great. Only when they were on the water’s surface would they become somewhat of a problem. Once more, Nie Yan plunged into the lake, then stuck his head out of the water. This region of underwater space didn’t have a lot of monster activity. Thus, he didn’t have to worry about any monsters launching a sneak attack from below. Soon, he discovered a Water Spider. They were a species of spider that grew to a very large size. They were capable of moving about at high speeds on the water’s surface. Unlike other spiders, they didn’t use venom to attack. Furthermore, they were even afraid of humans. As long as a player didn’t attack them, they wouldn’t take the initiative to attack the player. Nie Yan gradually neared the Water Spider from behind. Swiftly, he raised his dagger and pounced forward. Stabbing into the Water Spider’s back, he managed to attack it several times in quick succession. The Water Spider shrieked miserably before lunging towards its attacker. Nie Yan quickly dodged, and then returned with another stab. Saving enough energy for a Vital Strike, he stabbed the Water Spider in the eye. Letting out an agonized shriek, the Water Spider’s legs shrivelled up and curled towards its body as it floated on the surface of the water. After dying, it dropped a single copper. Nie Yan caught the copper coin it dropped before swimming off towards another Water Spider. The drop rate for Fine Silk was 0.5%. In other words, Nie Yan needed to kill around six thousand Water Spiders in order to obtain the thirty pieces of Fine Silk. This would require about three days of nonstop grinding. Three days would be enough time for Nie Yan to raise his level to three, learn the Combat Medic skill, and return to town to purchase a few skill books. His strength would improve quite a bit. 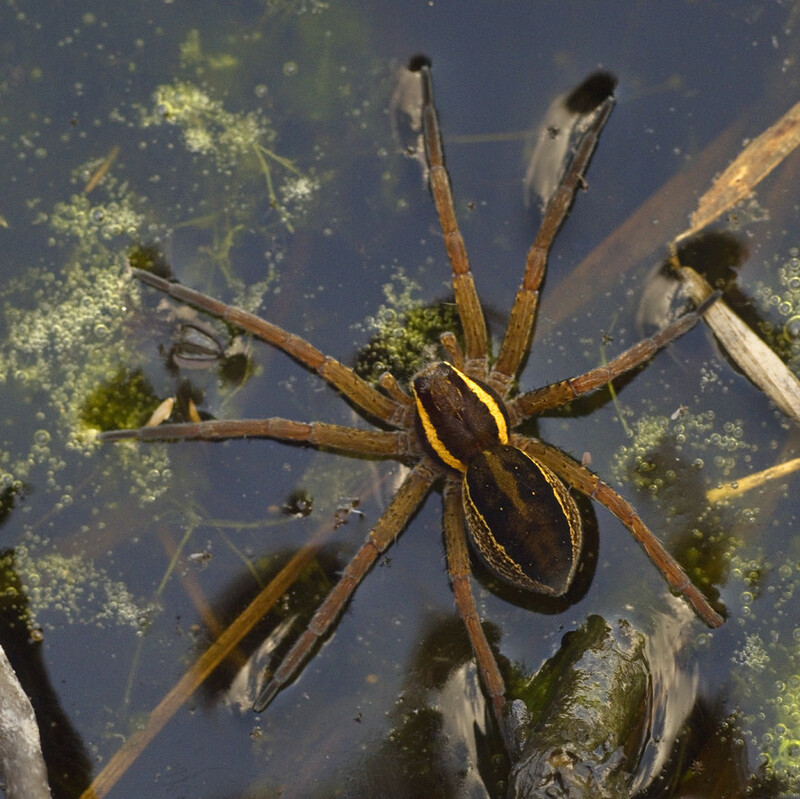 In the far distance, Nie Yan saw a Water Spider moving at high speed on the surface of the lake. A single spell fell from the Heavens and struck the Water Spider down. Soon, a damage value of thirty-six floated over its head. It was Holy Smite—a spell used by Holy Mages. There’s another person in this area? Nie Yan became vigilant and went on high alert. Looking far off into the distance, he noticed a person being pursued by a Level 3 Water Spider. It was quite far away, so Nie Yan could only see that this person belonged to the Holy Mage class. Not only this, but the Holy Mage was a woman as well. She was clutching a blue-coloured staff in her hand and was wearing a white mage robe over her body. However, he was still unable to clearly distinguish her features. It seemed that she was in a bit of trouble. Nie Yan stayed silent for a moment. Afterwards, he dived underwater and swam towards her. If she was a hostile player, he would kill her without hesitation. However, if there was no enmity, he would lend her a hand. That Holy Mage was dealing with the pursuing Water Spiders. By coincidence, she was also swimming over in his direction. At last, Nie Yan’s head broke out of the water. He was now approximately five meters away from her. Noticing another person—Nie Yan—popping out of the water, the Holy Mage tensed up. Immediately, she changed directions and swam over to another location. She was currently being chased by several Water Spiders. If she encountered a person who took pleasure in kicking others while they were down, it would undoubtedly mean her death. Both parties were already in close proximity. When the Holy Mage turned her head around, Nie Yan could clearly see the other person’s appearance. She was a beautiful looking young woman. Her hair was tied back in a ponytail, with a single lock of hair hanging down from the side of her face. Her cheeks were white, and her eyes were as clear as water. Although Conviction altered a player’s appearance, they were only slight adjustments. The overall attractiveness of the player would not be altered. Hence, their level of attractiveness would fundamentally be the same as it was in reality. This was also one of the reasons why Conviction drew people in. Nie Yan was able to clearly see at a glance that the Holy Mage across from him was a real beauty. The Holy Mage worryingly gazed over at where Nie Yan was located—their two eyes converged. She turned around and continued to fend off the Water Spiders. Simultaneously evading three Water Spiders was definitely a little challenging. However, she still remained very calm. Using a Haste scroll on herself, her speed immediately increased by several fold. After recognizing the opposite party’s appearance, Nie Yan’s mouth opened so wide a chicken egg could fit in it. How did I end up meeting her here!? He couldn’t help emotionally sighing at how minuscule the world was. The beautiful woman across from him was called Yao Yao (Dark Mystery). Come to think of it, in his past life, the two of them actually had a rather complicated and ill-fated relationship. Never did he expect that they would meet again here. It appeared lovers or enemies could truly not avoid meeting with one another. Perhaps this type of chance encounter was meant to be. Nie Yan and his friends were going to enter an instance. However, they were short a Mage. Thus, one of his friends brought Yao Yao into the team. This was the first time they had met. Afterwards, they gradually grew closer when they found more opportunities to party up later on and had many more adventures together. Old friends are the same as before, Nie Yan sighed with deep sorrow.